The New York Times plans to introduce a metered billing system on its Website sometime next year. The newspaper will begin to charge frequent visitors to its Website along the lines of what the Financial Times does on FT.com, which starts charging people who visit the site more than 10 times a month. But the new model is unlikely to move the needle on the New York Times’ digital revenues. Details are spare on how exactly the model will work, but it is possible to do some rough back-of-the-envelope calculations. 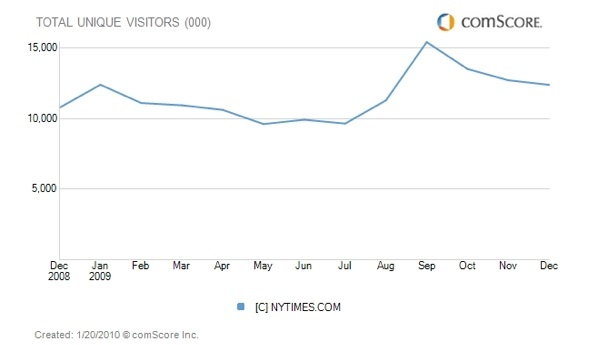 According to comScore, NYTimes.com attracted 12.4 million U.S. visitors in December, 2009, down from 15.4 million in September, 2009. If you include all the sites the New York Times operates, including About.com, Boston.com, and the sites of various local papers, the numbers jump to 52.8 million U.S. visitors in December. But right now the company is only talking about putting up a metered billing system on the NYTimes.com proper. So we are talking about an audience of 12.4 million in the U.S. and about 20 million worldwide. The average visitor in the U.S. comes to the site 3.7 times a month, a number which has been steadily rising. Let’s say for argument’s sake that the NYT adopts the same policy as the FT, and only charges people who visit more than 10 times a month. Let’s also be super-generous and estimate that 20 percent of its audience comes to the site more than 10 times a month, or roughly 3 million people in the U.S., or 4 million worldwide. Now subtract about a million print subscribers since they won’t be charged anything extra to read the paper online. How many of the 2 to 3 million loyal readers who are left will actually pay for the online edition, and how much will they pay? Back in 2005 to 2007, when the NYT was offering a partial pay wall through TimesSelect, it got 210,000 readers to pay $50 a year. That added $10.5 million to its top line. The FT.com charges about $25 a month to frequent visitors. But the FT is a financial publication and, like the WSJ, readers are willing to pay more for that information. The NYT appeals to a broader demographic, so let’s assume the pricing will fall within the range of $10 to $15 a month. If the New York Times gets 10 percent of its frequent readers who aren’t already subscribers to pay $10 a month that would come to as much as $3 million in extra revenue worldwide (300,000 X $10), or an extra $9 million a quarter. In the third quarter of 2009, the New York Times recorded $39 million in Internet advertising revenues across all of its newspaper properties. Adding $9 million would be a significant jump. But what you also have to take into account is that those Internet advertising revenues were down by $8.8 million from the year before due to the advertising recession and the decline in classifieds revenues. So at $10 per online subscriber, the New York Times would only be replacing the online advertising revenues it lost last year. If it can charge $15 or get more than 300,000 subscribers, the numbers start to make more sense. And if the meter drives more people to subscribe to the print paper, that’s even better for the New York Times (and, in fact, I suspect that growing print subscribers is really what this is all about). However, there is one last part to this equation. How many of those 3 million readers who hit the meter will simply stop coming to the NYTimes.com and find their news elsewhere? To the extent that the New York Times drives away a portion of its online audience, its online advertising revenues will drop as well. Getting that balancing act right will be crucial to the success of this metered scheme.